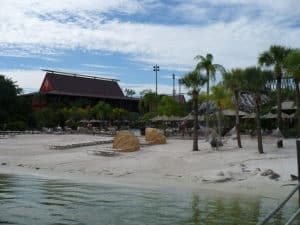 Are you considering staying at the Polynesian Resort in Disney World Florida? The Polynesian is a deluxe Walt Disney World resort hotel which is conveniently located on the Seven Seas Lagoon just minutes from Disney’s Magic Kingdom. Travel on the monorail or by boat and you can be in the Happiest Place on Earth in just minutes. 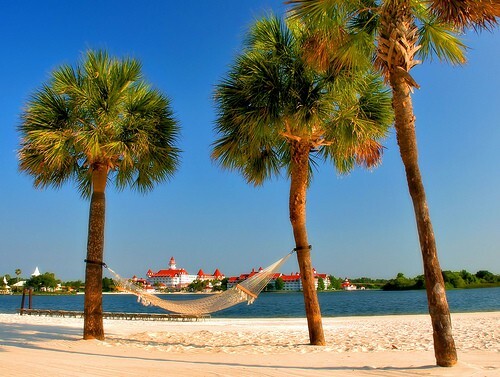 This luxury hotel not only has a great location but also offers some of the largest hotel rooms in Disney World, a relaxed South Seas theme with a welcoming tropical atmosphere, a sandy beach, excotic waterfalls, excellent restaurants and recreation facilities. But is this the right choice of Disney hotel for your vacation? Browse through this guide to find out more of what the Polynesian Resort Disney World has to offer. The Polynesian was one of the original Disney hotels and opened in 1971. The hotel has been extensively refurbished in recent years. The rooms were all updated in 2006 and the pool area in 2001. The Polynesian was part of Walt Disney’s original vision for the ultimate theme park. As soon as you step into the lobby you are in a different world. Leave the chaos of the theme parks behind and be transported to a tropical paradise. You will find lush landscaping both inside and outside the resort. The lobby is a tropical rain forest with a relaxing water fountain as a center piece. The lobby is a great place to sit and people watch when your feet are tired from a day in the parks! The Great Ceremonial House is four stories high and houses the lobby, restaurants, shops and some hotel rooms. Most of the Polynesian’s rooms are in one of the eleven ‘longhouses’ located around the resort. Each longhouse has either 2 or 3 floors. 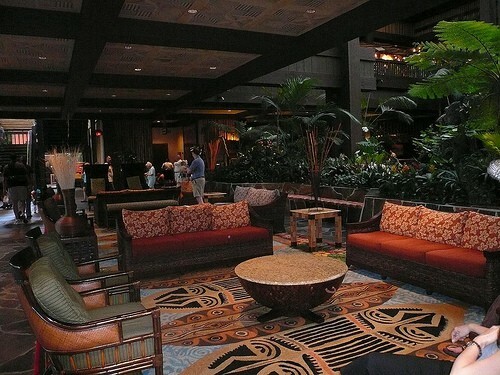 The Polynesian Resort has some of the largest hotel rooms in Walt Disney World. So if you are looking for space this is a good choice with standard rooms being around 410 square feet, with he 476 square feet rooms are located in the Tokelau, Rapa Nui and Tahita longhouse buildings. Each room can sleep up to 5 with 2 Queen beds and a daybed. A child up to the age of 3 can also be accommodated in a crib. Suites are also available in the Hawaii longhouse. Concierge rooms are in the Tonga and Hawaii buildings. One disadvantage of the Polynesian is that not all of the rooms have balconies. If you have your heart set on a balcony then make sure that you request one at the time that you make your booking. What most of the rooms do have is good views. The location of the Polynesian Resort Hotel is of course one of the very best in the whole of Disney World , and many rooms overlook the Seven Seas Lagoon and some even have unobstructed views over Magic Kingdom. Garden view rooms are sometimes misnamed! They can have a view over the gardens, the pool, the marina or the parking lot. So be sure to specify exactly which view you want and are expecting. The better views are of course at a higher price, but it is confusing that you book a Garden View and end up looking at a parking lot, so be sure to be clear with your request. As with all room requests they are not guaranteed but you do increase your chances of getting what you want if you request at time of booking and follow up with a fax to the Polynesian Resort on 407-824-3174 to specify the room view you want. Which are the best rooms at the Walt Disney Polynesian Resort? Rooms and the Polynesian Resort Hotel rack rates range from $365 to over $900 a night depending on room type and season. Suites at the Polynesian start at around $630 and go to over $3000 per night. The first thing to remember is that not all of the rooms have balconies so if this is important then you must request one to increase your chances of getting one! There are 11 longhouses with different pros and cons. For families who want to be close to the resort pool then Samoa is a good choice. If you like to be nearer to the Grand Ceremonial House building with restaurants, shops and the monorail stop then Fiji, Tonga, Rarotonga, Niue and Samoa are your best bets. Are there any rooms to avoid at Disney’s Polynesian? It is best to avoid rooms in the Rarotonga longhouse which are on the monorail side and the parking lot view rooms in Rapa Nui. Guest of the Polynesian speak highly of the concierge service. Although the rooms are essentially the same you will enjoy free breakfast, afternoon snacks, evening hors d’oeuvres, hot appetizers and wine. There is a dessert service from 8pm to 10pm every evening and this gets particularly good reviews! Some may say of course that the extra perks of the food and concierge service are not worth the premium price but it really depends on how prepared you are to pay for that bit extra. There is an additional reason to choose concierge rooms at the Polynesian. The location of the second floor lounge has a fabulous view of Magic Kingdom Castle. This is the perfect place to watch the Magic Kingdom fireworks and concierge guests are the only ones who have access to this lounge so this is an excellent perk. 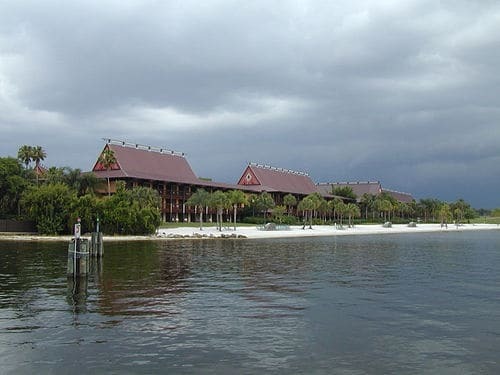 The location of the Polynesian Resort is one of the best in Walt Disney World as you have a choice of monorail and boat to get to the Magic Kingdom. It is possible to walk to Magic Kingdom from the Polynesian but it is a long way as you have to walk almost completely around the Seven Seas Lagoon. You may want to save your energy for walking around the parks instead! Guests can also take the boat across the Seven Seas Lagoon to Magic Kingdom from the Polynesian Resort. This is one of my favorite ways to arrive at the Magic Kingdom! 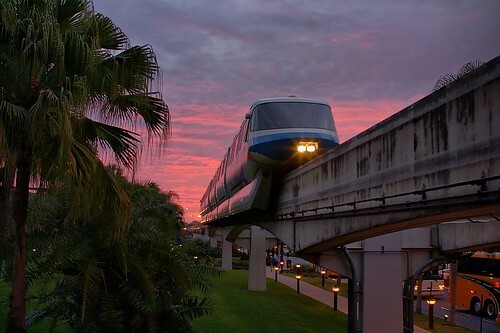 The monorail will also transport you from the Polynesian hotel to the Transport and Ticket Center which is the hub of the monorail and bus transportation for Disney World. You can easily get to Epcot on the other monorail line from the TTC. Buses to all the theme parks, water parks, Downtown Disney and the other resort hotels leave from the TTC. There are also Disney buses from the Polynesian Resort bus stop outside the Grand Ceremonial House which will take you to Disney’s Hollywood Studios, Animal Kingdom and Downtown Disney. These buses may also pick up guests at the Grand Floridian and Wilderness Lodge Resorts. Unfortunately these buses can sometimes be crowded and take a while to reach their destination so you may find that at busy times in particular you want to get the monorail to the TTC and then a bus onwards from there. 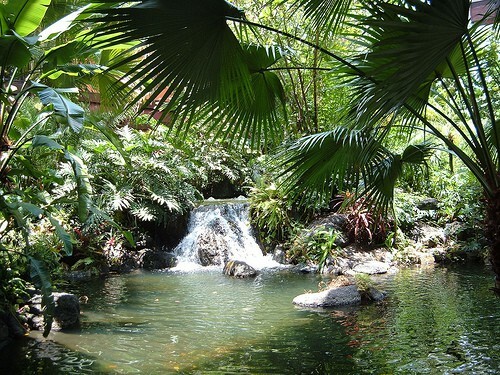 The landscaping both inside and outside of the Polynesian has a relaxing tropical feel. There are 2 swimming pools. 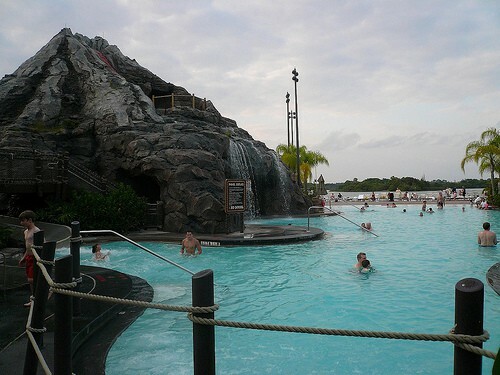 The Nanea Volcano Pool is one of the nicest of any of the Disney World resort hotel pools. It has a waterfall, a slide and even a volcano! This is also a very popular pool and it is not exactly very large so it does get crowded sometimes. If you want some peace and quiet there is another pool at the resort. If you want to visit a fitness center the Polynesian does not have it’s own but you can go to the one at the Grand Floridian Resort. There is also a 1.5 mile jogging trail which goes around the resort longhouses and passes Shades of Green Resort. The Polynesian Resort has a good choice of restaurants and of course is home to the Spirit of Aloha Dinner Show. The Kona Cafe is a full service restaurant offering breakfast, lunch and dinner which is located in the lobby of the hotel. Breakfast here is around $10 and upwards for an entree with American cuisine. You will find the usual favorites of pancakes,steak and eggs and omelet. A popular choice is Tonga Toast a variation of French Toast with sourdough stuffed with banana served with strawberry compote. Lunch entrees are around the $15 range with dinner entrees starting at $20. Fish and steak with an Asian influence is the specialty. Ohana offers a family style breakfast with Lilo and Stitch. Food is brought to your table and includes scrambled eggs, fried potatoes and Mickey Waffles. Prices are $24.99 for adults and $13.99 for children aged 3 to 9. Dinner is also family style but without characters. The specialty is food on skewers with dips which are brought to you by your server. There is a fire pit right in the center of the restaurant, and you will be entertained with hula hoop contests and coconut races. If you want a quick snack then visit Captain Cook’s Snack Company. It serves scrambled eggs, breakfast potatoes,Tonga Toast and Mickey Waffles. The Barefoot Pool Bar serves drinks by the pool. A very popular dinner show is the Polynesian Luau. 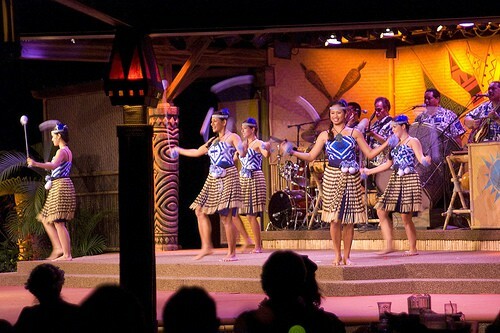 This how energy dinner show features Polynesian music and dancing. Food is served family style and brought to your table. The food includes pineapple coconut bread,barbecued pork ribs,roasted chicken and Polynesian rice. Dessert is Kilauea Volcano Delight. The price of the Polynesian Luau also covers drinks including Bud and Bud Lite beer, house wine and a selection of non alcoholic beverages. The cost of the Polynesian Luau is based upon one of 3 seating categories with Category 1 being the closest to the show. The rate for adults ranges from $52.99 to $61.99 and for children aged 3 to 9 from $256.99 to $31.99. This includes tax and gratuity. The Disney dining plan can be used for Category 2 and 3 seating only. It will use 2 Disney dining credits per guest. If you want to have Category 1 seating you will have to pay separately even if you are on the Disney Dining Plan. Shows do sell out so you must make Advance Dining Reservations. Remember that if you want to cancel you must do so at least 48 hours in advance or your credit card will be charged.